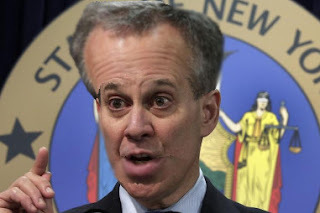 Emails obtained by the Energy & Environment Legal Institute (E&E Legal) show that the offices of New York Democratic Attorney General Eric Schneiderman and those of other politically aligned AGs, secretly teamed up with anti-fossil fuel activists to launch investigations against groups whose political speech challenged the global warming policy agenda. These emails, obtained under open records laws, shed light on what followed after a January meeting, reported by the Wall Street Journal on April 14, in which groups funded by anti-fossil fuel Rockefeller interests met to urge just this sort of investigation and litigation against political opponents. Recently, after the think tank the Competitive Enterprise Institute (CEI) criticized the AGs’ intimidation campaign, U.S. Virgin Islands Attorney General Claude Earl Walker — one of the AGs working with Schneiderman — subpoenaed ten years of the non-profit organization’s records relating to climate change. The latest email release strongly suggests a financial incentive for AGs to pursue their political opponents, rather than merely silencing and scaring away support for those who dare disagree with their extreme global warming agenda. The e-mail correspondence between Schneiderman’s staff, the offices of several state attorneys general, and various activists covers the weeks leading up to a March 29 “publicity stunt” press conference with former Vice President Al Gore, to announce the targeting of opponents of the global warming agenda. The correspondence shows government officials actively trying to hide their coordination, by using a “Common Interest Agreement.” This sought to protect as privileged the discussions about defending President Obama’s controversial global warming rules, and going after political opponents using the Racketeer Influenced and Corrupt Organizations Act (RICO). Pawa and Frumhoff have been pushing for this investigation for years, at least since a 2012 workshop entitled “Establishing Accountability for Climate Change Denial,” a brainstorming session in California for activists on ways to convince state attorneys general to investigate “deniers” using RICO laws. As the Vermont and New York correspondence show, Pawa and Frumhoff were invited to secretly brief the state attorneys general. They each received 45 minutes to provide arguments on “climate change litigation” and “the imperative of taking action now” immediately prior to the AGs’ press conference, according to schedules prepared by Schneiderman’s office. The documents obtained by E&E Legal also include responses to a questionnaire sent to the state attorneys general by Schneiderman’s office. U.S. Virgin Islands AG Walker reveals his interest, having just completed an $800 million settlement from Hess Oil company, in “identifying other potential litigation targets” and ways to “increase our leverage.” The Hess money, Walker wrote, was used to create an “environmental response trust”. In the end, it seems the only parties that may be breaking the law are those colluding AGs in their scheme to silence political opposition, while seeking funds for their preferred policy agenda. It is they who need to come clean. Chris Horner is an attorney in Washington, D.C. who obtained the email records for the Energy & Environment Legal Institute. He is also a senior fellow at the Competitive Enterprise Institute. Read more at Watts Up With That.